Several priority initiatives are being led by NITC GIS Council members and working groups. These efforts work toward statewide data and service solutions to provide quality and accurate data that meets state and federal standards. The NESDI comprises of geospatial data layers that have multiple applications and are used by a vast majority of stakeholders. These layers meet quality standards and have data stewards to maintain and improve the data on an ongoing basis. They are consistent with the Federal NSDI "7 framework layers" and provide additional layers of particular importance to Nebraska. There are several working groups supporting the planning and management of this initiative. 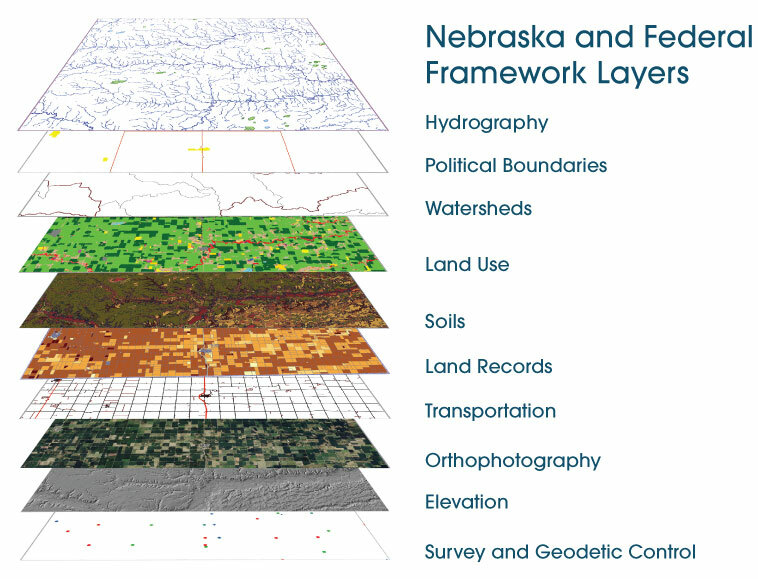 NebraskaMAP is the public's access to geospatial data in Nebraska. It is responsible for being the only authoritative clearinghouse for state government data. It started as a metadata portal to inventory and provide linkages to several geospatial data layers. Based on needs of the 2012 Strategic Plan, efforts are underway to enhance NebraskaMAP into a multi-use enterprise platform. This will provide the public access to additional peer-reviewed Nebraska SDI data, maps, and GIS web services. A NebraskaMAP working group and the Office of the CIO GIS Shared Services provide the planning, management, and implementation of this initiative.